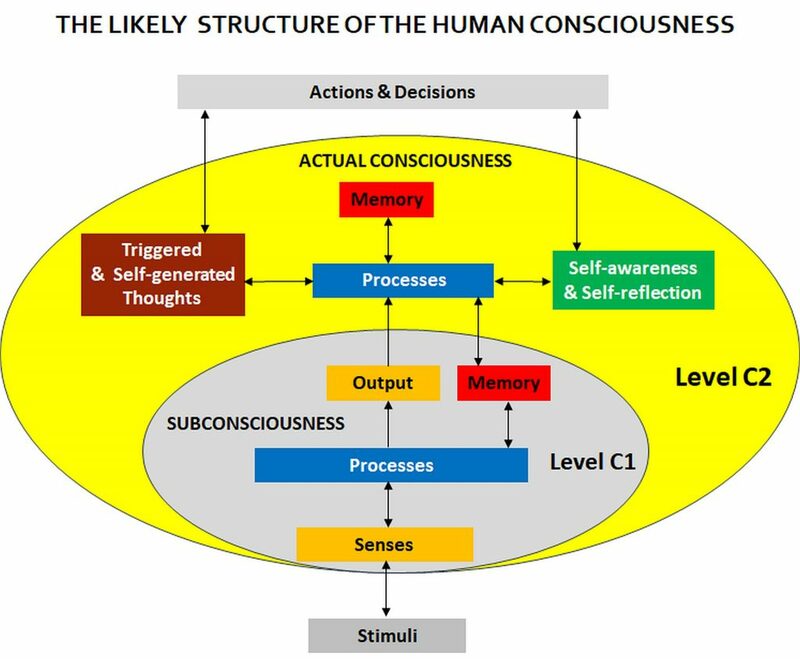 Subconsiousness – dimension C1, containing information and the huge range of processes with the required algorithms in the brain where most human intelligence lies. That is what enables us to choose a chess move, or spot a face without really knowing how we did it. The researchers believe that this type of consciousness has already been represented in a digital form and is comparable to the kind of processing that lies behind AI algorithms that are embedded in DeepMind’s AlphaGo or Chinese Face++. The ability to maintain a huge range of thoughts at once, all accessible to other parts of the brain, making abilities like long-term planning possible. In this area there is already some progress. For example, in 2016, DeepMind developed a deep-learning system that can keep some data on hand for the use by an algorithm when it contemplates its next step. This could be the beginning toward global information availability. The ability to obtain and process information about ourselves, which allows us to do things like reflect on mistakes. This proposition closely correlates well with a theory that Actual Consciousness (C2) is driven by billions of networks that bind together information from Subconsiousness (C1) following stochastic probability similar or identical with the principles of quantum mechanics (Stanislas Dehaene, 2017). Should those recent findings and proposals from Collège de France in Paris become generally accepted then that might resolve the questions posed by Roger Penrose about the nature of consciousness. He may be right that consciousness is not just the brain-mind construct but is also underpinned by phenomena similar to those present in quantum mechanics, however not in the way he suggests, i.e. in the ‘hardware’ (microtubules). The quantum mechanics’ Uncertainty Principle would not act at the level of individual synapses but rather at the level of neural networks, which connect thousands of synapses and give an averaged response at a macro-level, e.g. lifting a hand. Since that response would be only probabilistic and not based on yes-no state of an individual synapse (and hence its similarity to quantum phenomena), it will ensure that there will be no conflict with the preservation of free will. That might also be in line with the thinking of people like Raymond Tallis, who so strongly defends the validity of free will (i.e. unpredictability of human actions). And that’s how the scientific world may slowly be arriving at some common understanding on the nature of consciousness, and by extension, the feasibility of uploading a human mind together with its consciousness to Superintelligent being. Such an approach to the nature of consciousness provides a clearer view on a number of questions in this area. For example, it allows for a gradual development of consciousness over millennia of life’s evolution, which might have started with automatic, chemistry based responses, in plants ‘seeking’ best nutrients, i.e. being somewhat aware of the environment. In the animal world the level of self-awareness would be directly correlated with the brain size relative to the body mass and complexity of neural connections. When these two parameters reached a tipping point, human consciousness was ignited in Homo sapiens and other humanoids, such as in the Neanderthal Man. If we accept this notion, then human consciousness, having physical strata and differing only from animal self-awareness because of a much higher level of complexity and self-organization of billions of stimuli and memory cells, can be replicated in a different than a biological strata, such as in ‘silicone’. Therefore, the main assumption taken here is that once Superintelligence emerges, it will be possible that at some stage it will become a conscious agent.